Richard Battye is one of Birmingham’s best photographers. His new series, ‘PROJECT’, sees him casting original photographs of the everyday onto the naked human body and then re-photographing them. Without the use of Photoshop, the sensual, ethereal effect is all in the intersection of lighting, posture and projection. Everyday source imagery of graffiti, an abandoned skip or rusting machinery is re-imagined as beautiful bodyscape art. I met up with Richard Battye to find out more about his enchanting projection art photography. Richard Battye tells me that he moved to the Midlands as a student in the 1980s and never left. He has spent his whole working life in Birmingham; today he has a studio in Aston. He made his name as a photographer with ‘This England’. You can read The Guardian article about ‘This England’ here. His hugely successful series was a collection of uncompromising shots of the UK’s goths, bikers, battle re-enactors, morris dancers (!) fetishists and punks at the turn of the century when people were just getting going with tattoos and body piercings. He spent much of 1999 on the road asking subjects “Can I shoot you?”. The exhibition toured for three and a half years across the UK and internationally, including to Los Angeles. This was his springboard to success: work with the BBC, Arts Council England and Harley Davidson, followed. Battye went on to create series such as ‘Still Dancing’ and ‘Body of Work’ in which he collaborated with leading dancers and performers from Birmingham Royal Ballet. He was able to capture their movements while they were in ‘mid-flight’. “I was working a lot with dancers and I just said ‘show me what you can do’ and we started to get some really strong images from this.” Exploring the human body and its movements, he began to see the human form as both model and canvas. His new ‘PROJECT’ has grown out his concept of the model as a canvas and his extensive work with performers. 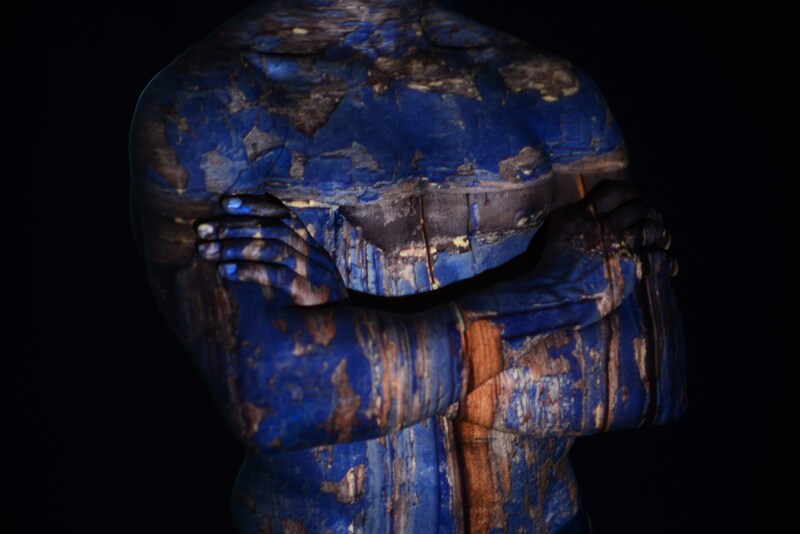 Using projection art photography, he turns the body into a landscape and screen. Figures, both male and female, appear against empty, black backgrounds. The focus is on their form, posture and position, onto which the projected photograph looks almost painted. So, without using Photoshop, how does Richard Battye do it? He explains that lighting is a key part in capturing the human form and especially with the dynamics of a dancer: “Working in both the studio and live on location it always struck me how different lighting conditions affected the quality of a shot on the body and it is this that has led me to new personal project called simply ‘PROJECT’”. “In this process I am literally projecting original photographs onto the human body and then re-photographing them. I have infinite control of the creative result choosing the model, the projected images and the direction I give, to alter a model’s position and form that maximizes the final result. It is the blending of the model the image and my direction that creates some very unique results”. And the original source imagery? “I shoot these on transparency film not digitally and there is good reason for this. It can be anything from interesting textures, colours, graffiti, rusting machinery, perhaps an old skip at a scrap yard. Light is again important and sometimes I see a potential original subject and will wait days for the perfect conditions to capture a shot I know will have impact on the human form”. The projected photographs looks almost painted onto the models. There’s a strong, Surrealist element to the series. As Richard Battye explains: “Whilst I know some images will work with certain body types it is often the unexpected, which produces the most striking results”. Out of the shadows emerge sensual bodies, separated from their identity, almost abstracted. Some images are easy to read, others take more time. They recall the dreamscapes of Paul Delvaux and the illusionistic paintings of Salvador Dali. “I like to work with a variety of people with differing body shapes, both male and female and with different skin colours as the choice of model really does make a huge difference to the end result. The combination of projected shadows often blends and transforms with real shadow created by the projector. Defining features such as a bolt, door handle, or piece of text all becomes one with the human form and it is this part of the process that I find particularly fascinating”. There’s an atmosphere of mystery to Richard Battye’s projection art photography. A culmination of his experience of photographing performers and interest in the human form, ‘PROJECT’ shows him creating canvases out of his models. The transformative effect is sensual, Surreal and quite stunning. With many thanks to Richard for talking so openly about this magical new ‘PROJECT’.